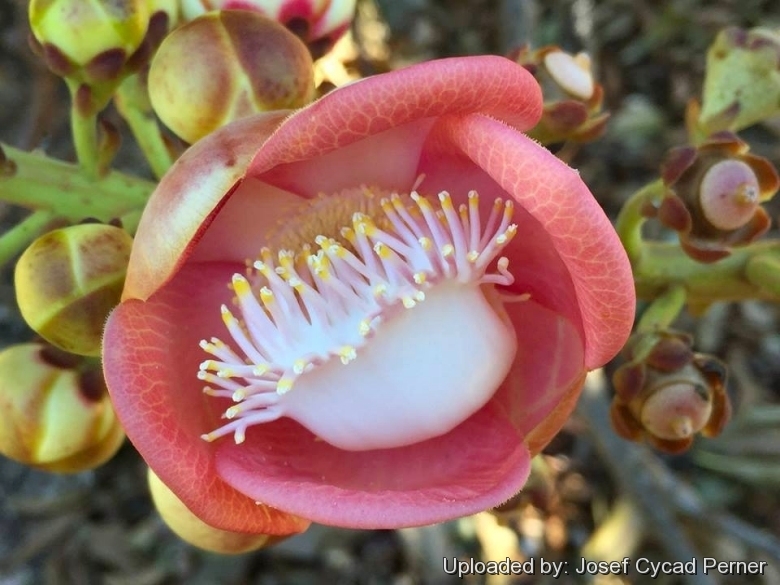 Origin and Habitat: Couroupita guianensis occurs naturally in a wide area from Central America (Honduras, Costa Rica, Panama) to Northern South America (Bolivia, Colombia, Ecuador, Honduras, French Guiana, Venezuela and Peru), especially in the Amazon Basin, but rare and restricted. The species is also very widely cultivated as an ornamental treeoutside its native range in towns and cities, such as in United States, India and Thailand The species is frequently planted as a botanical curiosity in other tropical and subtropical botanical gardens in many parts of the world. Habitat and Ecology: Lowland semi-deciduous rainforest and river banks, subjected to periodic flooding. The habitat of this species has declined widely because of clearing for settlement, timber and agriculture, resulting in populations becoming threatened at a national level. Pekea couroupita A.Juss. ex DC. Leaves: Simple, alternate, in dense bunches at the ends of the branches on 0.5-3 cm long petioles; lamina simple, narrowly obovate to elliptic. The clustered leaves vary in length, generally from 8 to 31 centimeters, but reaching up to 57 in lenghth by 3-10 cm. They are vglabrous on upper surface, pubescent on veins on lower surface, base cuneate and apex acute to acumi-nate, margin entire with 15-25 pairs of secondary veins. the foliage branches. The extrusions are from 60-180 cm long. The inflorescences are unbranched racemes, sometimes branched and paniculate. Pedicel/ hypanthium 1-6 cm long. Some trees flower profusely, until the entire trunk is buried in flowers. Flowers zygomorphic: 5-6 cm across, brightly colored, and strongly scented, especially at night, and in the early morning. Calyx lobes 6, broadly ovate with ciliate margins. Petals 6 yellow in shades of pink and red near the bases and yellowish toward the tips. Androecium extended on one side into a flat, pale yellow pink tinted hood. Stamens arrangement in a staminal ring at the centre, the ring stamens with white filaments and pale yellow anthers, and an arrangement of hood staminodes often white at the base, pink for most of length, and yellow at apex. Ovary 6-locular. One tree can bear 1000 flowers per day. 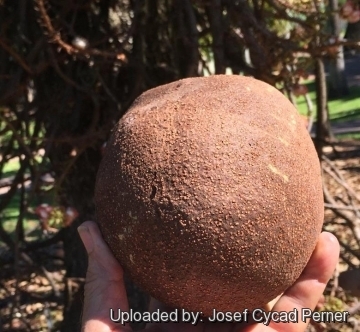 Fruits: Indehiscent, very spherical , 12-25 cm diameter, woody, dark-brown, capsule falling from tree at maturity. Inside there is a dense pulp carrying tiny seeds. The fruit takes up to a year to mature in most areas, sometimes as long as 18 months. Seeds: 65-550 per fruit (mostly about 300), embedded in pulp, the pulp oxidizing bluish-green when exposed to air, the testa with trichomes. 3) Wikipedia contributors. 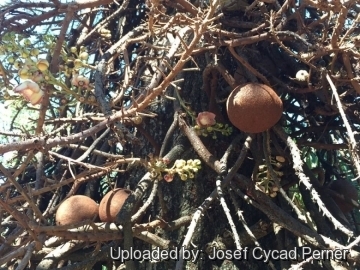 "Couroupita guianensis." Wikipedia, The Free Encyclopedia. Wikipedia, The Free Encyclopedia, 24 Jul. 2015. Web. 22 Aug. 2015. 5) Mori, S. A. & G. T. Prance. “Lecythidaceae - Part II. The zygomorphic-flowered New World genera (Couroupita, Corythophora, Bertholletia, Couratari, Eschweilera, & Lecythis).” Fl. Neotrop. Monogr. 21(2):95–103. 1990. 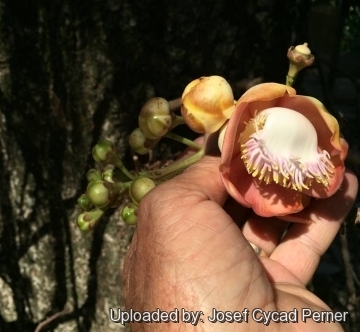 7) Lim, T. K. “Couroupita guianensis. In: Edible Medicinal and Nonmedicinal Plants.” Volume 3: Fruits. Springer. 2012. 9) Brako, L. & J. L. Zarucchi. (eds.) “Catalogue of the Flowering Plants and Gymnosperms of Peru.” Monogr. Syst. Bot. Missouri Bot. Gard. 45: i–xl, 1–1286.1993. 10) Davidse, G., M. Sousa Sánchez, S. Knapp & F. Chiang Cabrera. “Cucurbitaceae a Polemoniaceae.” 4(1): i–xvi, 1–855. In G. Davidse, M. Sousa Sánchez, S. Knapp & F. Chiang Cabrera (eds.) Fl. Mesoamer.”. Universidad Nacional Autónoma de México, México. 2009.
crown, with leaves clustered at the tip of branches. It is relatively easy to grow and very adaptable to soil type. Fertilization: Need a perfect fertilizer diet including all micro nutrients and trace elements or slow release fertilizer at the start of the dry and rainy seasons. Light: Prefers full sun but will tolerate low light. Hardiness: It can be difficult to get this plant to look its best without a great amount of heat and sun.and so it is only really suited to the tropics in frost-free regions (USDA Zones 10a - 12b, 28°F minimum). In cool temperate climates (e.g. in Florida) , leaves tend to lack a strong green colour and fruits are not commonly produced in the large numbers they are in Tropical America. Drought tolerance: This tree like abundant waterings, since its habitat is along riverbeds, but in cultivation it grows well under dry conditions. During the summer or warmer months, water frequently to keep the soil from drying out. They need also elevated summer humidity, a dry atmosphere can be fatal. Remarks: Few people are aware of just how large this palm can get, and one often sees it planted in places where its going to cause real problems later on. This tree is not recommended for small yards. Aerosol salt tolerance: Low, the plant does a lot better inland then it does on the coast. Maintenance: If properly placed, you will not need to prune it but you should expect many fallen leaves and potential damage from the heavy fallen fruits. .
Use: Its very neat appearance and stature makes it perfect for Park, Shade ans Specimens. Edible Plant Parts and Uses: Fruits are edible, vinous and pleasant and are occasionally eaten, but the smell of the white flesh discourages most people from trying them. The pulp of the fruit is white, acid and not disagreeable. Fresh pulp is used by natives to prepare a cooling medicinal drink. 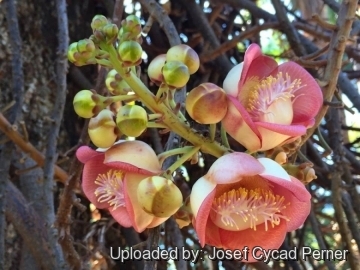 The flowers of Cannonball tree have a wonderful smell and can be used to scent perfumes and cosmetics. The hard shells of the fruit are sometimes used as containers. The pulp of the fruit of C. guianensis is used to feed animals such as chickens, muscovy ducks, turkeys, and pigs. Its wood is used to manufacture toys, boxes, parquet blocks, rackets, casting moulds and light artefacts. C. guianensis is considered a sacred tree in India by Hindus. Buddhist scriptures tell us that the Lord Buddha was born under the shade of a Sala Tree and died between two of these trees. Propagation: Fresh seeds germinate quickly and the seedlings are attractive.